Which programming language is a smart choice to start a career? It’s reasonable to say that you have many options to help you build a prominent future in coding, but some of them are more alluring. For the past 20 years, three languages have been ruling the programming world: Java, C, and C++. In January, 2019th, Java heads the list of TIOBE Programming Community index (a popularity ranking based on data from 25+ search engines). It is easy to learn from scratch. Java is a structured, object-oriented language, comprehensive for beginners without any tech background. It is a multi-purpose language for mobile & desktop software development, Internet of Things, etc. A short while ago Oracle reported, that Java runs on more than 3 billion of different devices. Java is a secure language for enterprise developments. An overwhelming majority of Fortune’s 500 companies choose Java, and the same goes for numerous small and medium businesses. It has a vast and supportive community. Today there are more than 10 millions of Java developers worldwide, and the number is only going to increase. Java developers have high incomes. According to Indeed.com, the average salary of Java developers exceeds $ 100 000 per year. To reach a Java Junior level you need at least 3 to 6 months of intense studying with a great share of practice. Probably, each experienced developer will advise you to code every single day to master the skill. It was much harder to become a programmer twenty years ago when there were only “dull” books to study the subject. Nowadays, there are dozens of online courses and platforms for coding at your disposal, so you have everything it takes to manage a well-balanced education. 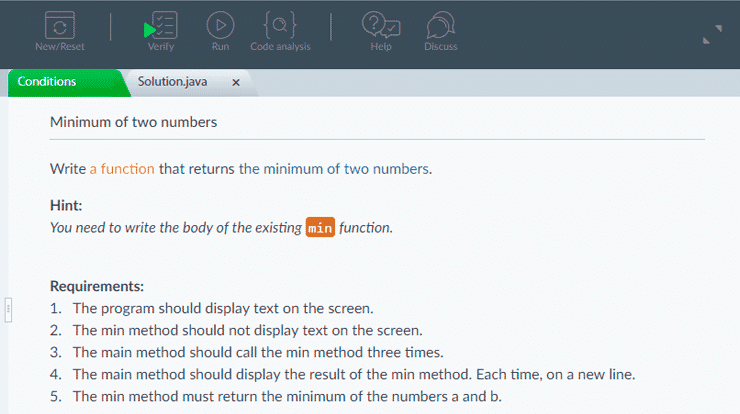 Today let’s review the features of a source for learning Java with a fresh approach — CodeGym. 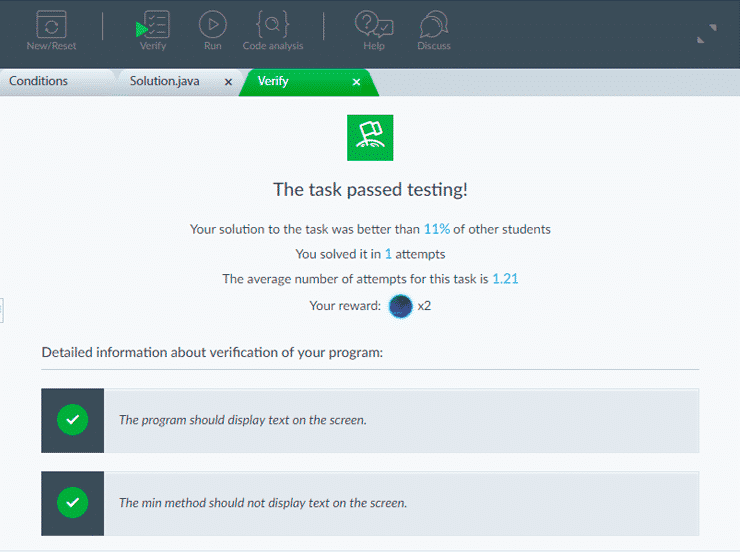 It is a gamified online platform for learning and practicing Java programming from scratch. The key idea of CodeGym course is to give the programming experience in Java in an uncommon way and prepare learners for the real job. It works for users even with a zero background in IT. The whole course starts with explaining the simplest concepts, this is why the entry levels might be easy for those who have past experience in programming. But the entertaining concept won’t let you get bored anyway. Here’s the list if its major features. A real game instead of thick books and boring lectures — that sounds fun. 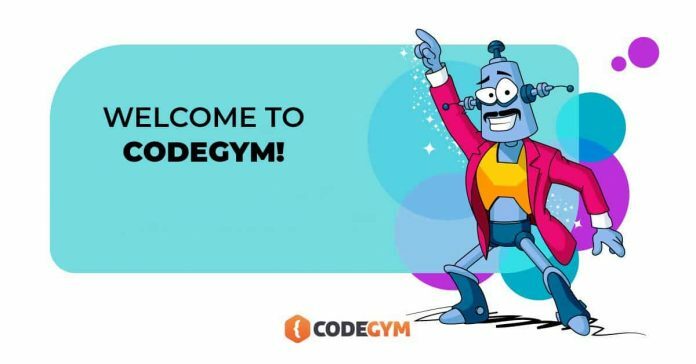 CodeGym has a futuristic plot. You start a journey from a level 0 with a short prequel. 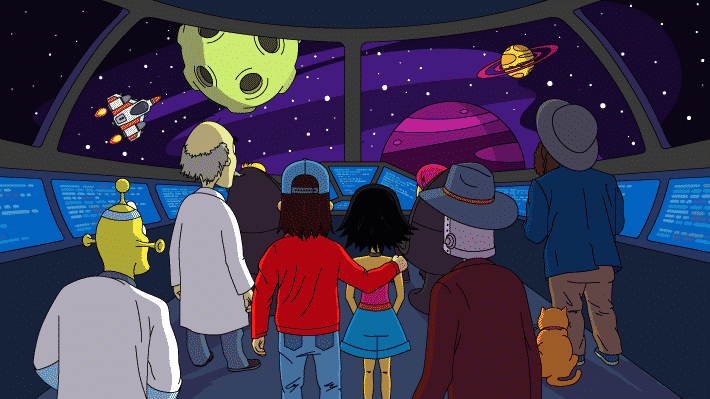 It’s the year 3018: a distant future with traveling across the universe, robots, and aliens. A crew of Galactic Rush crushes on the unknown planet inhabited with “wild robots”. To fix the spaceship and return home, they need help from robots. To get the help, they need to teach them programming. Or at least one: the young robot Amigo. He’s a character you “play” for. The main goal of the game is to level up the character by reading lectures and solving tasks. In such a way you upgrade your own coding skills from a ground zero to a junior Java developer. The whole crew teaches Amigo, and each character plays a certain role in his education. A “lecture” covers a certain topic in a conversational format with the real-life examples and a dash of humor. Also, there are plenty of motivational lectures to keep you interested in your learning experience and rewards for successful studying: you will receive some “dark matter” for each task you solve. The whole course is divided into for “quests” that cover the basic concepts of Java. As for today, the first two quests (Syntax, Core) are free for passing, and two more will be available soon. Java Collections teaches how to use collections and many popular frameworks and tools for real-world programming. A single quest consists of 10 levels, and each level has 12-13 lessons. Every lesson is dedicated to a certain subject and includes a theory plus a set of tasks to solidify the knowledge. Code entry, where you need to repeat precisely a part of the code. You can write your solution in a web version of IDE or use a desktop version. With each level the tasks get more complicated, so inevitably you’ll become confident in utilizing the proper software for coding. Each successful solution brings you a certain number of “dark matter”. You need it to move forward and open further lessons and practice. It means the only way to make progress is to solve all (or almost all) tasks. Some of them are easy, some are tricky and require your full attention, sense of humor and logic, some are complicated and demand a great amount of time to come up with the right solution. And that’s the main trick: one can’t pass the whole game without dedicating hundreds of hours to coding. Approximately 80% of all the time a student spends on the course he’s busy with coding. 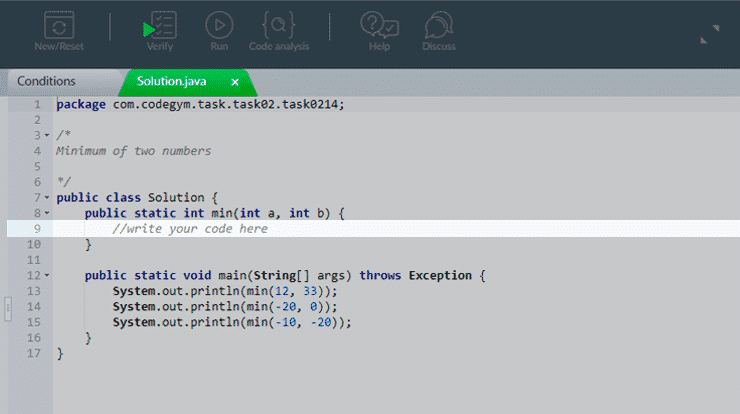 CodeGym is a relatively young educational platform for learning Java, and its community is expanding rapidly. 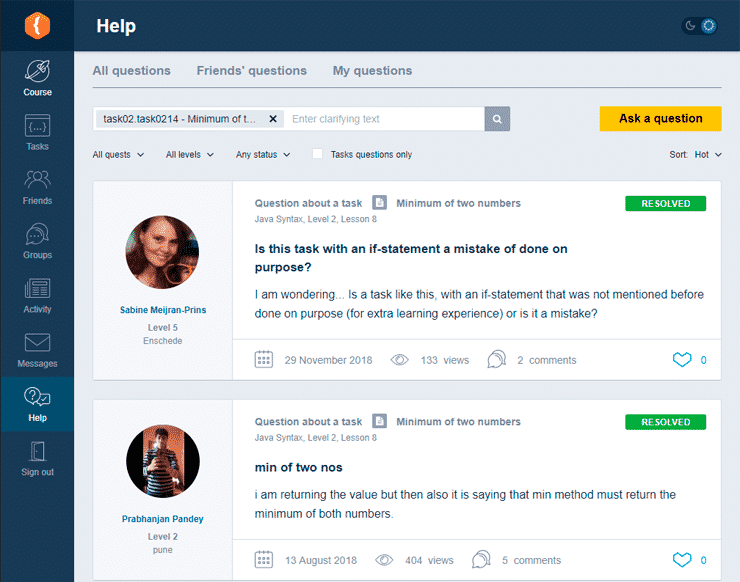 The bigger the number of students, the easier it becomes to use one of the major features — a “Help” section. 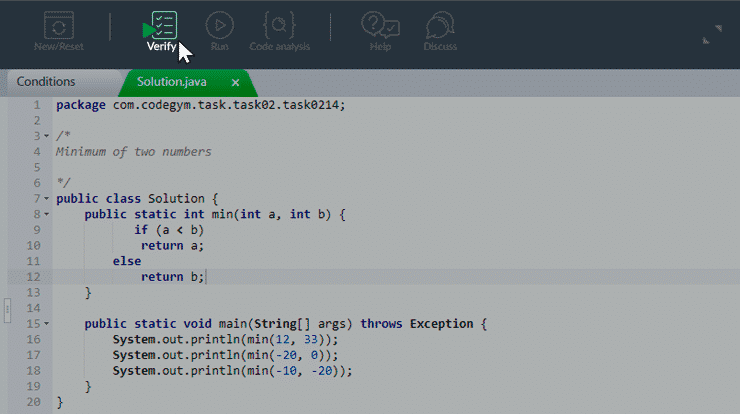 CodeGym offers comprehensive training for those who want to learn how to code in Java. It can be chosen as a major platform for education and practice. The gamification and engaging pattern of the course will keep you motivated till the end. As a result, you will have hundreds of hours of coding, and that is a very good background for those who want to start a career in programming.